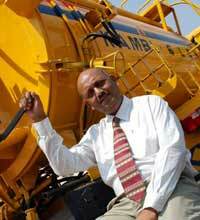 After 14 years of toil, Manohar Krishna is poised to unclog the closed Indian attitude with his mechanised drain cleaning system. When Manohar Krishna saw his job go down the drain, he didn't realise that his future-and fortune- lay in drains. It was 1991, and Essenjay Marketing, the Pune-based company that he had worked for 11 years, shut down because its supplier of cleaning machines folded. The job loss shook Krishna-he had just had a baby, his wife had given up her job to look after the newborn child and his landlord wanted him to vacate the apartment immediately-but it also stung an unexpected response from him. "Many may say that we integrated backwards with presence across the value chain, but it was done to survive and we kept learning from our mistakes." Along with his colleague Pankaj Malhotra, Krishna decided to set up his own marketing firm. The two men pooled in their savings and established Kam Marketing. We had an address to collect mails and nothing more as most of our time was spent in the field, getting orders and pitching for them, says Krishna, an alumnus of IIM Bangalore. After a few weeks of thinking to sell various products, they finally found the one thing that they felt comfortable with: manually operated drain cleaners, which were being manufactured by TTG Industries, the Chennai-based diverse equipment manufacturing company. "When I accepted the contract (agency for Pune), I had no idea what the market potential was," says Krishna. What he realised, like many of us do, was that cities and towns across the country have innumerable choked drains that are not only unhygienic but also a problem for the authorities. "That meant an opportunity," he adds. Their comfort level with TTG showed as the duo generated good revenues for the company in the first year itself, clocking a respectable Rs 12 lakh. Suitably impressed, TTG appointed Kam Marketing as its agent in Mumbai and Gujarat. Though the two were doing well in their venture, they were uncomfortable about meeting the fate that they had with Essenjay. Their fears were realised when TTG found that the scale of the drain cleaning equipment manufacturing division was minuscule and decided to close operation. They were on the verge of being stranded again. But "we couldn't make the Essenjay mistake", says Krishna. So, despite having no experience in manufacturing such equipment, "we decided to give it a shot because it would free us from depending on the manufacturers' whims", he says. In 1995, Kam Marketing was reborn as Kam-Avida Enviro Engineers, which was set to manufacture automated drain cleaners. To take care of the technical knowhow which was required to establish such a unit, two more partners joined them-Avinash and Porus Dadachandji, who were engineers in the merchant navy. Listening to Krishna reminisce, his ability to trounce adversity seems to be innate, but the path he took was tough to traverse and needed extreme grit and determination. Having started with a single manual machine, Krishna has come far. 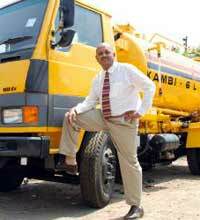 His Rs 40-crore company now has a slew of automated drain cleaning systems used across the country. The company's client list boasts top hospitals, hotel chains, restaurants and corporations, even municipalities and airports. Today, Kam-Avida has four divisions: drain cleaning equipment, compacting garbage disposal trucks, industrial vacuuming machines and street sweepers. But none of this happened overnight; the expansion has been incremental. "Many may say we have integrated backwards, with presence across the value chain-manufacturing, sales and maintenance-but it was all done to survive and we kept learning from our mistakes," explains Krishna. In the initial phase, the presentations Krishna and Malhotra made on the cost-benefit analysis of their products were received well by professionals, but these didn't always convert into orders. Kam-Avida's big break came seven years ago with the World Bank-funded drain cleaning project for Navi Mumbai, which included a five-year maintenance contract. This was the one big project that gave their business the much needed impetus. Starting a venture is not easy, but that shouldn't stop you from testing your idea. - Being an entrepreneur is lonely. - It's vital to have tomorrow's ideas. - Ideas must be invaluable Believe in yourself and money will come your way, not necessarily soon. - You don't have to be the most intelligent person, but must have vision and should be able to lead a team of smart people. - A good leader should be secure enough to create more leaders, not followers. Another thing that helped get orders was Krishna's ability to jump into action to demonstrate the equipment. For instance, when he got the TTG contract for Pune, he found that the Military Engineering Service men at the air force station in the city were struggling because a blocked pipe had created a huge, stinking pool of sewage. A month later, they hadn't been able to clear it. Krishna heard about the situation from the garrison engineer and offered to demonstrate. With clockwork timing, he inserted a 100-foot-long flexo-rigid rod fitted with a sharp arrowhead into the drain. The blockage cleared and an impressed garrison engineer came through with a Rs 12,000 purchase order. "Nothing can beat the feeling when you see a satisfied client after a good clean-up job," he says. The business at inception might not have been capital intensive, but now, with 10-15% of revenue from operation and maintenance contracts, capital is needed to expand. So far, Rs 5-6 crore in bank loans has helped fund the working capital requirements. Now, Krishna plans to fund expansion with private equity: Kam-Avida is close to finalising a deal worth Rs 30 crore in private equity investment with a US-based firm. His factory at Hinjawadi, Pune, an oddity in the otherwise snazzy neighbourhood dominated by companies such as Infosys, is already expanding. According to media reports, last year, Kam-Avida raised equity from Peepul Capital Fund, with the intention of using the money to set up a manufacturing and assembly unit to increase production capacity and improve its sales and marketing. While waiting for the Indian market to mature, Krishna also explored developed economies, where he did not need to sell the concept of drain cleaning. Closer home, the subcontinent, with its usual problems of clogged drains, is turning out to be a lucrative market. Krishna hopes that exports will contribute to a sizeable portion of resources in the future. Surprisingly, raising money has not been the biggest problem, says Krishna. The real bottleneck has been battling image. "In India, cleaning is considered taboo," he adds. So when they started, much of their work was educating people, convincing them that machines were necessary to clean. "It required, and continues to require, a big change in mindsets," he says, adding simply, "I think of myself as a cleaner with dignity."